We were at the Safeway this weekend, when I saw this. I’m still perplexed by the idea of “chicken fried chicken”. 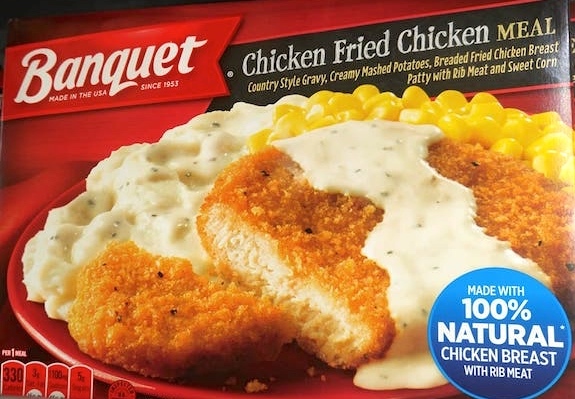 “Chicken fried steak” (I was taken aback by this one, too, at first) means “steak fried in the manner of fried chicken”. So “chicken fried chicken” would be “chicken fried in the manner of fried chicken”. That is, fried chicken. Well, no. 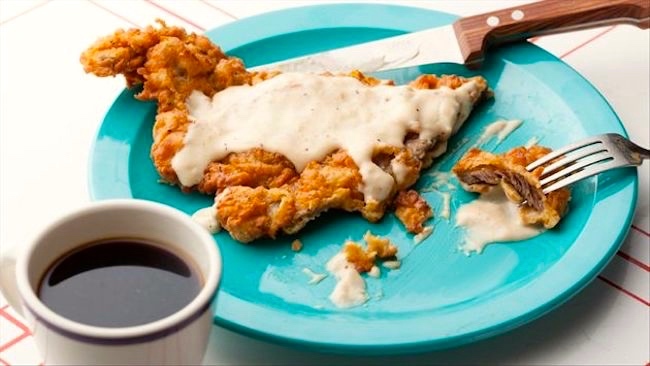 Chicken fried steak doesn’t mean ‘steak fried in the manner of fried chicken’; it’s the name of a dish, a fried steak preparation that resembles in some ways Southern fried chicken. As I hammer home again and again, Labels Are Not Definitions. Southern fried chicken. Pieces of chicken, not boned or re-shaped, coated and then fried (usually deep-fried, but sometimes pan-fried). Chicken fried steak … is an American breaded cutlet dish consisting of a piece of [boneless] beefsteak [usually a cheaper cut] (tenderized cube steak [pounded flat]) coated with seasoned flour and pan-fried. It is sometimes associated with the Southern cuisine of the United States. Despite the name, the dish contains no chicken, but is so-named because the cooking method is similar to that of fried chicken. Chicken fried steak resembles the Austrian dish Wiener Schnitzel and the Italian-South American dish Milanesa, which is a tenderized veal or pork cutlet, coated with flour, eggs, and bread crumbs, and then fried. It could perfectly well have been called Beef Schnitzel or Beef Milanesa. Now if you make this preparation with boneless chicken breasts, you get something you could call Chicken Schnitzel (the name we used in my Columbus household) or Chicken Milanesa — or chicken fried chicken. This entry was posted on April 12, 2018 at 10:06 am and is filed under Categorization and Labeling, Language and food. You can follow any responses to this entry through the RSS 2.0 feed. You can leave a response, or trackback from your own site. Two minor additions. Some of my friends have insisted that chicken fried steak is defined by more than just the manner of preparation. They’ve suggested that the frying is done in the oil previously used for frying chicken (presumably filtered for particulates). When pressed on what to do if you have steak & haven’t fried any chicken recently, they will admit that any appropriate oil will do. It’s unclear whether there’s any historical significance to this. Schnitzel is another matter. In my experience, Austrians, Czechs & Israelis all claim that Schnitzel is something close to a national dish. The Austrian version (as you pointed out, Wiener Schnitzel) is pretty straight up pounded, breaded (unflavored, mildly-seasoned crumbs) & fried veal cutlet. Pork is an alternative that has to be specified – if you serve pork as Wiener Schnitzel in Austria you will get dirty looks. Unsurprisingly, Wiener Schnitzel is an EU geographically protected denomination. Non-veal variations are German, not Austrian. The Czech version is virtually identical except for the possibly more aggressive crumb flavoring & a particular kind of gravy (much like Milanesa/Milanesi). I’ve never met a Chech who had a problem with chicken or pork versions, but I’ve only met a few and none were professional cooks. The origin is pretty obvious, considering now-former Czechoslovakia being a prominent part of Austro-Hungary (like Northern Italy). Both Czech & Austrian versions may traditionally require (per Escoffier – the author, not the company) four layers/dips for breading – milk, flower, egg, crumb, although the first two are now often contracted. No such luck with Israeli version which is strictly chicken and involves no dairy – just eggs & crumb. (You might see water & flour once in a while for the base layer.) Veal isn’t popular in Israel & pork isn’t Kosher, so chicken is dominant. When you hear “Schnitzel” in Israeli (and often other Jewish) household, it’s safe to assume chicken (not zebra). The seasoning & flavoring also tend to be more aggressive here. In particular, sesame seed & hot paprika are common adjuncts. I suspect, I’ve mentioned this in the past.